Last week we introduced the idea of the Precon Effect wherein a card’s occurrence in a deck list is perpetuated by its initial inclusion in one of the preconstructed commander decks. Players entering their nearly unaltered pre-constructed decks into Tappedout or Deckstats databases increases the occurrence of those cards in the list and makes them more likely to be recommend by EDHREC. This may just sound like EDHREC doing what EDHREC was designed to do: suggest common cards for a deck. Unfortunately just because a card is commonly played in a deck, doesn’t make it the best choice for a deck, it just makes it popular. While I refer to this as the Precon Effect, after the decks it was most noticeable in, it is seen in almost any deck on the site. This week I’d like to stick with Commander 2016 (C16) because it actually offers us a cool look at how the preconstructed effect can even apply to commander choice. 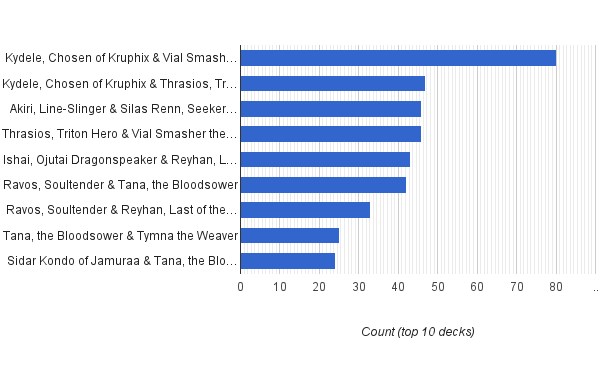 Check that out: only two of the top ten pairs are from separate decks. I think that’s pretty interesting. I don’t think this is just because the less common unmatched pairs aren’t any good. Pairs like Reyhan, Last of the Abzan & Silas Renn, Seeker Adept are pretty cool as an Arcbound sacrifice and recur deck and just recently our intrepid editor, Jason Alt, put together a Ikra Shidiqi, the Usurper & Sidar Kondo of Jamuraa deck that looked as though it had great potential for fun, powerful gameplay. 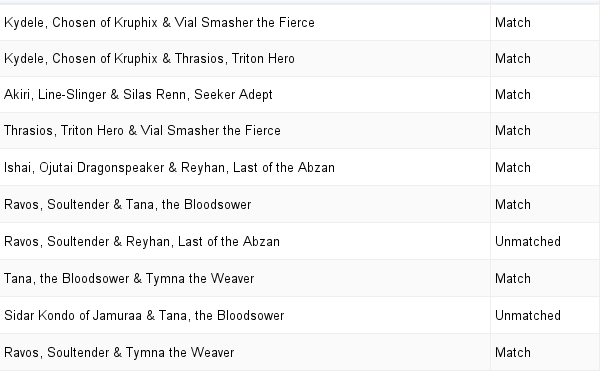 Vial Smasher takes the lead with Thrasios in second. 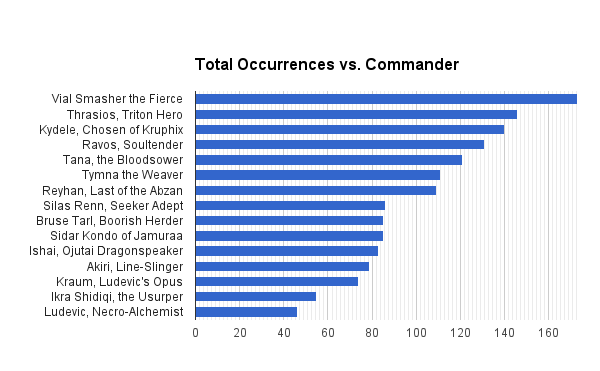 It’s odd that the most popular commanders aren’t the most popular pair, even though the most popular pair has twice the decks as the next most popular combination. Vial Smasher is awesome; in fact she’s the partner that I was most excited for from the get-go, and users clearly agree, what they can’t agree on is who best to partner her with. There has also been a lot of buzz over Kydele, who is clearly an incredibly powerful card. The question I have is why play these two together? Precon Effect has the answer; users are seeing them as the most popular pairing for these partners (38% of Kydele decks pair her with Vial Smasher, the greatest uniformity of any of the potential pairs), and just reinforcing that by building them together. But I think this is unfair. I think that while Kydele may be benefitting from Vial Smasher’s colors, Vial Smasher is getting the short end of the stick playing second fiddle to Kydele. I would propose that Vial Smasher would actually be better partnered with Thrasios, as he better compliments her propensity to cast one big spell each turn, as opposed to the Wheel of Fortune and Windfall decks that Kydele pushes, which tend to lead off their turn attempting to maximize Kydele with a wheel effect, which generally aren’t that mana-intensive, leaving Vial Smasher to deal a paltry three-ish damage. I think pairing Vial Smasher with Thrasios is optimal for two reasons: Thrasios’ colors give the deck access to the best ramp and the best card draw, and he nicely compliments Vial Smasher by providing those utilities himself when the deck has run out of gas. He’s the second most popular partner for a reason, and I don’t think it’s because he’s a great first-chair. He’s not the player that gets the solo, he’s the player that coordinates all the practice sessions, and ensures everyone has spare reeds prepped before going onstage. He’s the glue, the peanut butter to all the other partner’s fluff, he feels expressly built for the role of support, and that’s where I plan to use him. This was a good start, but there were some slots I needed to fill, so I hopped on EDHREC to see what I was missing and the results confirmed my suspicions. The Precon Effect was in full swing, and yet it wasn’t with cards from the actual precon, people seemed to be including cards without considering their overall impact on the deck. The issue I had wasn’t that the cards people included weren’t powerful, on the contrary, they were some of the most powerful cards in the format; my issue was that they just didn’t capitalize on the uniqueness of Vial Smasher’s ability. There were other options for those cards that would fill the same, or similar, role, without compromising the deck’s unique character. I’m going to mention all three cards that I’d like to cut right up front, this is partially to save time since this article has rambled on a little already, but also because I think they all don’t belong in the deck for the same reason (as mentioned above) their failure to make full use of Vial Smasher’s ability. The cards, in order of percent inclusion in the deck are: Cyclonic Rift, Demonic Tutor, and Counterspell. All three are under-costed, super efficient cards that define their card’s functional archetype (I suppose one could argue that Upheval takes that title from Rift, but as that’s banned in commander so let me have this one). These are powerhouse cards, and in most situations a great deal of that power comes from their ability to allow you to maximize your mana usage and cast multiple spells in one turn, but we don’t want that. Vial Smasher would much rather cast exactly one spell each turn. For me, I believe that every card in a deck should serve the purpose of the deck on as large a scale as possible. From the mana-ramp and fixing, to the card draw, and removal, all the cards should work together to fit the theme of the deck (where one exists and it’s possible to fit). Sure you can put Exsanguinate and Gray Merchant of Asphodel in every deck with black in it, but why? Yes they’re powerful, but there are over 16,000 unique magic cards, why keep playing the same core cards? Maybe I’m getting a little preachy, but it’s a bummer to me when I see someone with a cool, creative Commander, or theme for their deck, playing a bunch of staples because, “they’re good”. It was this drive to expand people’s deck building horizons that sparked this series creation. I don’t like to refer to myself as a “staple remover”, sometimes I will recommend a staple, but because it’s being overlooked and fits nicely with the theme of the deck. So what would I add to this deck to bring it more in alignment with the theme of getting discounts on our splashy spells? I’ll start off with Cyclonic Rift because it is the one that I think will be the hardest for players to let go of. The thing about Rift is that it can be done in the middle of an opponent’s turn, allowing us to keep open our mana in case something more pressing happens. The thing about rift is that, unless you’re going to capitalize on the clear board state (generally by attacking) then playing it on an opponent’s turn doesn’t matter as much except in the case that it gains us a mana advantage by casting it right before we untap. But what if we could get a similar advantage by getting a discount on our spell? I’m talking about Devastation Tide. The miracle mechanic actually allows us to cast this card on an opponent’s turn with a little bit of fancy footwork (and a Sensei’s Divining Top). But we get a similar advantage even if we cast it on our turn. Yes it’s not one-sided like Rift is, but we will still be able to rebuild before our opponents, no matter what turn we cast it in, and as a deck that plans to cast mostly non-permanents, the setback should basically amount to recasting Vial Smasher and that’s about it. Next let’s take a look at Demonic Tutor. I like to advocate the reduction in the number of face-down tutors that people run in their decks, it tends to make games more interesting, as well as more competitive by narrowing the number of “copies” of a card in their deck. In a deck where casting a two mana spell before casting another spell is actually counterproductive to your overall game plan then I like this card even less. A card I like in this place is Mystical Teachings. It’s still a tutor, but instead of being a face-down tutor that’s sorcery speed, we trade up to an instant speed spell, with flashback. It does cost more (which oddly enough is a positive in this deck), and the flashback cost isn’t lower than its converted mana cost, so we don’t get a discount on our damage, but the addition of flashback is pretty great, since it gives us a spell in our pocket to cast if we stall out a little. The final cut is a less popular card in terms of inclusion in decks, but one which I think has a great replacement Counterspell should 100% not be in this deck. There are so many “free” counterspells out there that can replace it with higher converted mana costs. The one I’d like to recommend the most is Rewind this card is a hard counterspell that is free as long as you have four lands untapped and doesn’t set you back mana. It’s everything this deck wants to do, and no one appears to be playing it. This is my personal decklist. It’s not optimal yet, I’m still getting games in with it, but I can say it is one of the most fun decks I’ve played in Commander in a long time. There are a lot of other suggestions here that I wanted to mention above, but didn’t have room for. I think the traps and Mercadian Masques alternate cost spells are both really effective in this deck. The inclusion of Sensei’s Divining Top and Scroll Rack are there to help the couple miracle spells. I realize that I’ve excluded Treasure Cruise; I made this decision because there is only so much room for delve spells and Murderous Cut and Dig Through Time are both instant speed, a much more important quality that this deck craves. One thing I’ve noticed myself in the couple weeks of playtesting that I’d love feedback on: the deck wants more instants, everything that could be an instant should be, I’ve considered Leyline of Anticipation but if all of my cards are already instant speed it does feel a little redundant, so I’d love further suggestions or thoughts for instant speed replacements for my sorceries in the deck. Is it worth going all the way to Natural Connection or is that just not powerful enough? Thanks for sticking through this one with me, next week will be a little less of a slog. Until then!